It has been two weeks since the first meeting of the 2nd series of woodcut classes at Belmar this summer, and so time for our second meeting. No giant rain storm this time, and no other group meeting at the Boatworks tonight, so we didn't have those problems to worry about. I was expecting to have all seven students on the roster appear tonight, so I used part of my time before class to set up three folding tables in the back gallery. I've had 6 students in the small education room a few times, and it's pretty tight, but the last time I had 7 students I was setting up in the rear gallery, also known as the main room in the building. At least I had less stuff to bring in compared to last time. People started arriving as early as 6 pm, and by 6:30 everyone had arrived. I quickly learned that one would not be coming, but since I had brought out all the tables and such, I continued to set up in the main room. I had put out two of my large prints for people to look at while we were waiting for all to arrive, so I explained a few relevant things about those, then put those away and got started on the focus tonight- cutting. Most had done some drawing on their blocks already, so they had a place to try some things out. I put out my supply of class woodcut tools, explained how the different types worked, gave the usual safety speech, and even demonstrated a little on the blocks that people had brought in. As time went on, people gradually got the hang of it, figuring the best way to hold the tools, and which ones worked best. Consensus seems to be that the shorter ones are easier to use, so I think I'll cut some more down to small size before our next meeting. One thought a tool might need more sharpening, so it was an excuse to get out my sharpening stone and show how that process works. I also showed everyone how the non-skid mats and bench hooks can help the process, and both of those had their fans before long. One student last week had asked about getting some of his own tools and had gotten some in time for tonight's class, though his drawing was the least finished, so he didn't have much opportunity to use them in class. His description of how helpful and friendly the suppliers were (plus the realization of how much work is involved in cutting a single block) had most of the rest of he class asking for ordering information tonight. The biggest negative tonight is that we discovered the air conditioner was broken. and since July was the hottest month in the history of the world (records have been set around the earth) and this part of the country has been mired in humidity for a few weeks, some of the students started drifting out before we were scheduled to end. I'm hoping they get things fixed before our next meeting in 2 weeks. But at least all those present tonight have their blocks in progress now, halfway through the class. There are always some things to take care of. I often try to group them by physical proximity, things that take place in the same general direction from home. 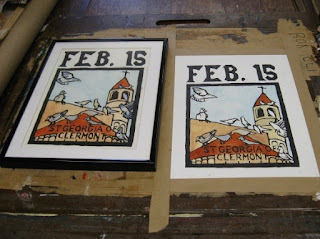 For instance, I went out this afternoon and drove north, first to my Studio. 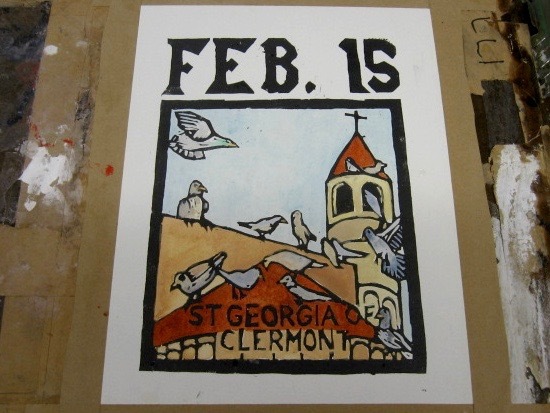 A short trip, where I added to the coloring of the proof of the St Georgia print I have in progress. Today I was putting color on all the birds, mixes of browns, grays, and blues mostly, typical of pigeons, the type of birds referenced in the story. These are pretty close to those in my prototype. Final version? Don't know yet. Kept the visit short, as this is the time of year when it can get very uncomfortable down there. Not too hot in the basement, but there is a dampness that forms, and coupled with the excessive humidity in our region this week, at times like a steam bath. But I had something else to take care of anyway, so I got on my way. Pointing south, and heading home, my next stop was in Belmar. I had arranged a meeting with Michelle, my absent student from the first meeting of my recent Belmar woodcut class. I was a little concerned, because she missed that one because of the heavy rain the day, and when I woke this morning around 6 am, there was a huge rain falling. (heard it more than saw it, as I stayed in bed and went back to sleep) Video on the news showed a lot of local flooding, which had subsided quickly, but more rain was expected through the day. I saw no problems while out and about, and I got to the Boatworks several minutes before the planned 4 pm meeting. Two trips to bring things inside the building. I usually bring a lot of stuff to the first class, so this was a simplified version of that. Left the big print collection at home. Did bring an assortment of books with prints in them, showing some historic prints- block prints from the Modern, an assortment of Masereel, Ward, and even the bound version of my Fourth Of July project. Cut her a piece of birch to her preferred size and orientation (grain horizontal), showed her the tools, looked at her sketch, gave her some advice. That took about a half hour, and gave her a good start on the project. A few drops falling as I left to go home, but no problem packing up and loading, and then I headed home. Next week we'll see if all 7 students show up for class. If so, we move to the bigger room. The day was free today, so I got a lot of errands done. Never a shortage of things to be done. One was art related, something that needed to be done soon. A couple of the jobs I had scheduled for this summer involve teaching linoleum cutting, very much related to woodcut. Both are relief processes, done more or less the same way, but with different tools and materials. The first time I taught linocut was several years ago, a workshop that took place in my Studio, and I have some of those tools still. 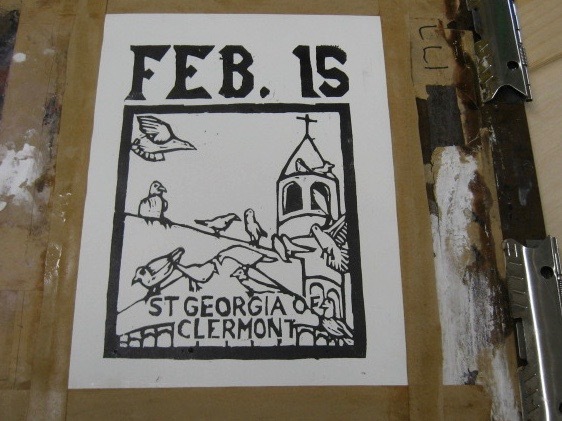 Contributed them to the linocut class that was held in Belmar back in June. Didn't lay in a lot to supplies for that one, since the owner of the establishment said she'd provide everything, but she did not acquire everything in time, so my tools and ink and brayers were part of the event. 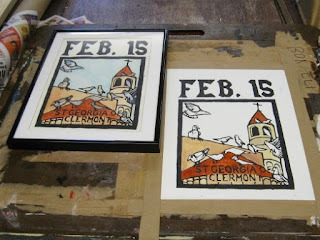 There may be a second Belmar linocut event at the same place in a few weeks, but I haven't got confirmation of that yet, so I don't know. However, there is another linocut workshop event scheduled in Brick in mid August, with a budget for materials, and I'm told there will be 10 participants. 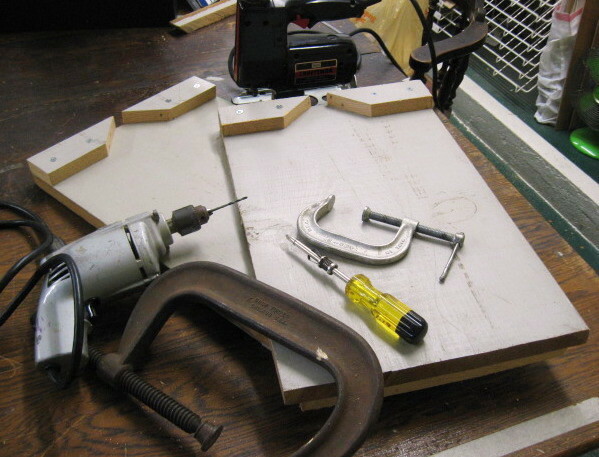 That budget is because they have no tools or materials, so they are my responsibility. In that way it is a lot like my woodcut class. A lot of paperwork has been done, and multiple people have confirmed it, which means I have a responsibility to be ready. Of course I still have the tools, ink, and brayers from earlier this summer, but that's not enough for 10 people. I received a nice stack of unmounted linoleum in the shipment that arrived last week, and I have plenty of ink and paper, but I needed more cutting tools. Earlier this summer the place had blades and 2 handles, plus linoleum. Some ink, but mine was better. I had 4 handles that could hold the cutting blades. Of the planned 8 participants, 2 had to cancel at the last minute, but I didn't mind, as it worked out perfectly with the total of 6 handles we had, so everyone worked, and everyone finished a print, which is how I like my classes to go. But four handles will not be enough to keep 10 youths busy next month. So I used part of today to drive to the best equipped art supply store I know of in the region, the only place that carries any printmaking materials. 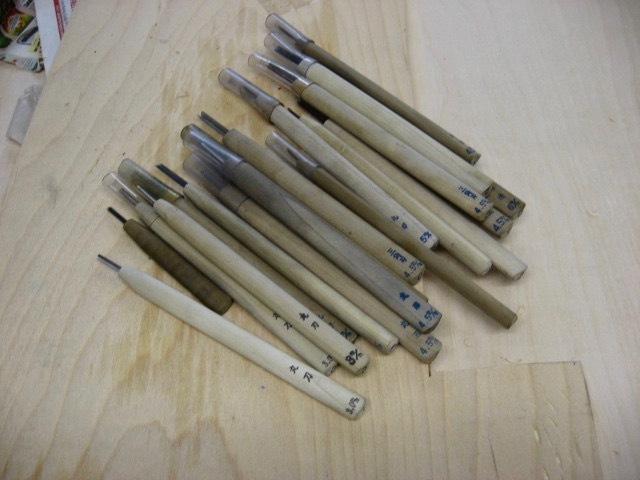 Picked up 3 boxes of linocut handles, each with two handles and an assortment of 6 push type blades- gouge type. Also a box of pull type blades, which can be very effective in this process. Before that event I plan to try and sharpen a few of the cheapo woodcut tools I have, get them into linoleum shape, so I should be good to go for that workshop in about a month. 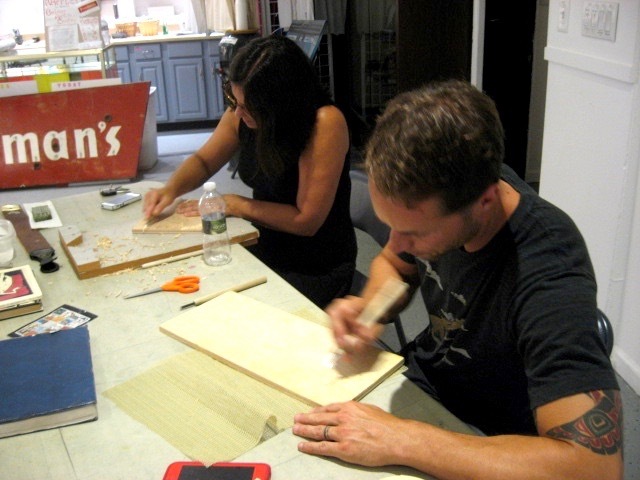 Tonight was scheduled to be the first night of the second set of woodcut classes this summer in Belmar. Got an e-mail response from the director when I came home from mowing the lawn, providing me with a requested roster of students, in the form of scanned copies of all the enrollment forms. That works. Left me with just one problem- every weather report said that a huge rain storm was scheduled to pass through my area in the late afternoon/early evening, just when I'd be needing to drive to Belmar and unload for the class. At least I was able to load the big and delicate stuff early (the stuff that can't get wet) in the afternoon. But everything was packed against the weather, so no problems there. Still a big concern- Belmar has a history of flooding in the rain. Had a storm almost keep me from getting to the opening class of woodcut there a few years ago and only my habit of going early got me there that day. So no surprise, the rain came, showed no signs of moving on, so I left plenty early. Both main road into town Route 35 and the back roads to the south west have a history of problems, so today I decided to try route 71. No good- within one block we got detoured back to where we had come, the road was closed. OK, let's try route 35. Police cars were blocking many of the side street leading from 35 into town, but 35 itself was open and clear, at least as far as 10th Avenue, my planned point of entry into town. That and Main Street also remained open, so I was able to get to get to the Boatworks by a reasonable time. Rain was still falling steadily, so I skipped my traditional slice for dinner and unloaded a few things that could survive a few drops of rain. The class room had 3 small tables set up, 6 chairs, but I figured we could use more table space, so I used the time waiting to bring in an extra full size folding table. My first student showed up about 15 minutes before our start time, and I had the expected 6 students all in place by the start of class, so I figured all was right. But when I went through the list I found one of my 6 was not among the names I had been sent today. She did have a print out of her online registration, which seemed to indicate that she was paid up, and the other paid student never showed, so we had the room and I figured we'd get it straightened out later. Class went on as usual. Started with some exchange folios (emphasis on relief and traditional prints), and some examples of my work (supermarkets, boardwalks), all of which are intended to show the range of possibilities with the medium. No demos tonight, but I did take some time to show the kinds of paper I'd have available for the class, and the kinds of tools we will be using . Cut everyone a block of wood (by now the rain had stopped and I could safely move the stuff inside) and gave some general advice for drawing their ideas. That took us up to about the end of class, so I answered any remaining questions and told them I'd see them again in 2 weeks, which is our next scheduled class. All that was left was to clean up. Packing materials when it's not raining goes a lot faster than when it is raining. Same for loading and unloading a car. And driving through Belmar for that matter. I will have to go back tomorrow to turn in some paperwork and see if I can figure out what is going on with my roster, but that's a problem for another day. Back to the Studio today for maybe the third time in a week. The last bunch of times it was mostly to continue coloring a saint proof, and I had thought about doing more of that today, but I had more pressing issues. 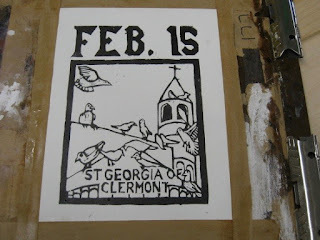 Turns out tomorrow is the first day of my next woodcut class series in Belmar. No surprises expected, but there is still work to do. I had received a box of supplies last week, much of which was ordered for my summer classes, such as some new woodcut tools. These are more of what they call their "standard quality" tools, not as expensive or carefully manufactured as their superior tools (which I use for my own art). However, they are a good value and still much better than anything else sold in stores (which is almost nothing these days) and I have been using them for this class for several years, adding a few more year by year, to meet the requested needs, or to replace ones that need it or have gone missing. The tools come with long wood handles, which users are expected to cut to their preferred size. In fact, they send instructions for how to best measure for this. I usually cut some of them down, and leave some longer, so students in the class can find what works best for them. I find that the shorter size fits the hand better and is easier to cut with (the more expensive ones I use come much shorter than these). So today I cut a bunch down to an easier size, 6 or 7 of them, a mix of blade types and sizes. Couldn't find my coping saw, so I used a keyhole saw. Forgot to bring any sandpaper with me, so the job was eventually finished at home, smoothing out the ends of the handles while sitting on my front step. The other task up at the Studio was picking up the wood I had stored there, such as that piece of birch the tools are sitting on in the above photo. If tomorrow goes as expected, the tools won't be used, just shown, but I will need the wood, which I will cut down into blocks and distribute to the students. Stuck it in the car for now. I have more than enough for blocks suitable to first projects, and if that runs low, I can get more. Meanwhile, I also verified that my saw is in the back of my car, that I have spare blades for it, and my straightedge ruler for measuring. Everything else I need it inside my apartment and I'll start gathering and loading the car tomorrow. 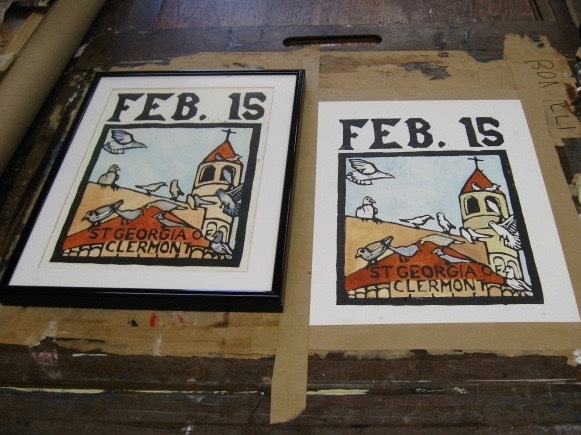 My other reason for going to the Studio today was to continue working on the proof of my St Georgia print, so I had brought my prototype with me. Today I moved on to the next big thing, the sky. In recent years, I have been using a very thin wash of pthalo blue for my skies, and I had some of that color on one of my watercolor palettes, so I put that wherever it was needed. Because the sky is almost half the print, the paper was fairly wet, and I decided it would be better not to try coloring any of the birds that were surrounded by sky, to avoid color bleeding. I did layer some of the blues, grays, and browns on birds on the roof in the foreground, not touching the sky in any way. Will probably need more touch up as we go. Do that next time, as well as all the other birds, and this one will be just about done. I made a pretty big order of print supplies just before the 4th, though with the holiday it took a few days for them to process it, but it went out and I received a delivery tracking number and information. The estimated date for delivery was Thursday afternoon, and nothing in the tracking system indicated a change was expected. I have things delivered to my parents' house since they are more likely to be home than I am to receive it. As it turned out, on Thursday afternoon they were home, but I went down anyway to make sure it would get into my hands. I have no idea when the delivery day ends. At 5 pm, nothing yet, but I was told they could go much later. Still nothing at 6 pm, so since I had people there who could receive it, I decided to go home. However, before I could pull out of my parking space, I saw a delivery truck rolling down the street. Shut off the car, and met the guy at the front door, who handed me my box. At home I had done a quick inspection to make sure it was all I expected, but to get a good view of all the contents, I brought it with me to the Studio this morning. A lot of the stuff is for print classes going on this summer. The stack of linoleum is for a class I'll be teaching in Brick next month, though I will use one piece to test the tools I have. An inventory I had done of my class woodcut tools, combined with the knowledge that I had 6 people sign up for the class, made me decide to add 5 new ones to my class supply. The can of ink is the standard oil based black I am using these days, and though I had some, I decided to get an additional can for the class supply. The new thing was to try the company's new pigment paste inks, which are water based in the Japanese tradition, and these were said (in the catalog) to make use of traditional ukiyo-e era pigments and color mixes. Potentially useful in my work, as well as something for interested student to try. Got the three primaries, which should allow me to make pretty much any color I would want. The Studio visit was very nice, but it's usually only a small part of what I have to do in a day as an artist. I didn't get around to writing about it yet, but over the weekend the mystery of my bench hooks was solved. I stopped by the Belmar Arts Council on other business, and was asked if I had seen the e-mail. I hadn't. Turns out a bin full of stuff was noticed in a corner, under some piled up stuff. I went in to check it out, and it was full of my bench hooks. So I don't need to make new ones, just have to hope these aren't misplaced before my class next week. Got some teaching related mail delivered today. My contracts for my university classes arrived, pretty much what I expected- the amount and classes I have gotten the past few semesters. Nothing is guaranteed when you are an adjunct (the university has a history of ignoring contracts that no longer suit their needs) but at least this shows things are progressing as expected. It was a reminder that I need to get my Disclosure form done and up to the university soon, so I downloaded it from the e-mail today, filled it out, and that's ready to go. Knowing who has to approve it and sign it might help choose the day I make that trip up to Union, but if I can't get an answer soon, it will be up to them to figure it out. Also an envelope from Ocean County, regarding my linocut class in August. All the addresses seem to be right now. I'll contact the library (where I'll be doing this) to verify a few things, then sign and send them off, all so they will pay me when the time comes. Made copies for my records though. Purchase orders instead of contracts, but as long as I get my pay, I won't care how it happens. Next on the agenda, getting some verification on the Belmar linocut class (also in August it seems) and then acquiring more supplies, the things my Portland supplier doesn't carry. The Belmar woodcut class starts in about a week, but I seem to have all the materials for that, just the challenge of loading them all into my car and getting them there. After spending the past few days updating the whole Belmar Arts Council blog (10 years worth of posts to be reviewed and adjusted as necessary), time to get back to work for me. The gap between visits was much shorter this time, only a few days since I taped the proof down. Started the coloring process today. My prototype is still in a frame from being submitted to a show, so I just brought it with me to the Studio. 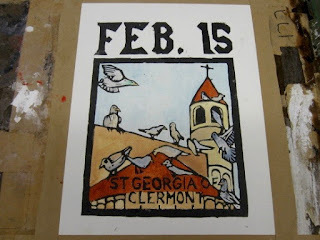 In about an hour I was able to color all the church parts. Trying to do more than that today would have likely led to one wet color bleeding into another, and a lot more work, so I ended it like you see above. Stuck the proof in progress, drawing board and all, in my drying rack. Move on to the sky in a few days. A few weeks ago the BelmarArts Council sent out an e-mail reminding us of the plan to close for a few weeks for a cleaning of the Boatworks, and that if we had anything stored there, to make sure it was properly labeled to make sure it wouldn't be disposed of. I had a large plastic bin for my class, which this year mostly contained several bench hooks I had made years ago. 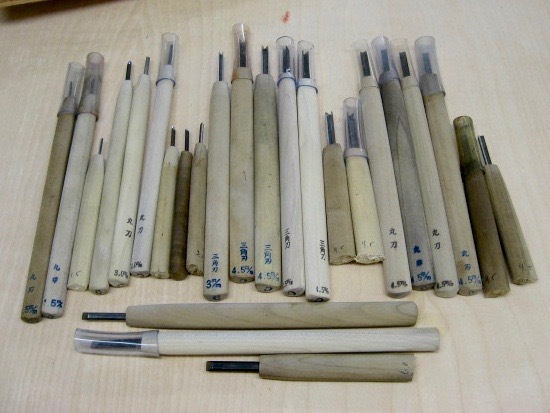 It's a low-tech device that can be very useful in the woodcut process. Basically a board with a raised edge at both ends, on opposite sides of the board. The one pointing down is placed against the edge of the table, while the one pointing up becomes a place to secure the end of the woodblock. The result is that the artist doesn't need to use as much energy and muscle power to hold the block in place while cutting, allowing both hands to be used to guide the cutting tool. I have made several over the years for the class to use, such as these two from 2012. Some students have quickly gone ahead and made their own, such as one I remember made from a wooden cutting board purchased at an estate sale. 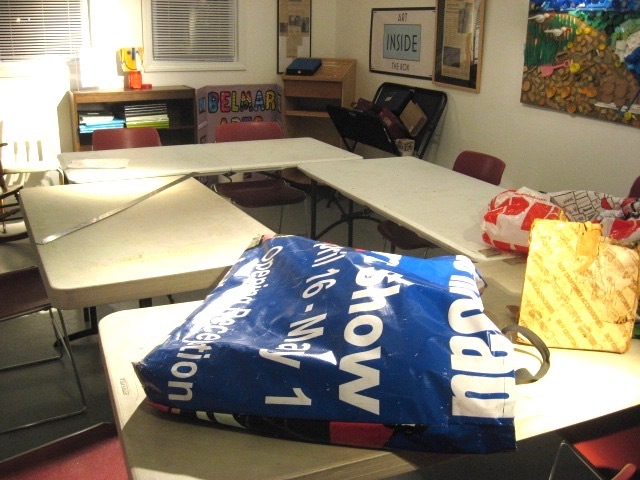 The plastic bin was on a shelf in the supply closet, marked with my name, a date of Summer 2018, and Woodcut Class. I pointed it out to our student worker, and she assured me it would be safe from the planned cleaning. Last week I stopped by the Boatworks to drop off my artifact for he Ancestors show, went to take a peek in the closet, but the bin was missing. Nothing else in there was marked to indicate that my items were relocated there. But the office was officially closed down until after the 4th, so nothing I could do then. They reopened today, so I stopped by in the afternoon on bits of business, including asking about my missing items. Diane, our new director, was in and mentioned seeing the bin on the shelf, properly marked with my name and class (which she knew was filled before this cleaning project happened), and followed me to the closet where she saw it was missing. Her plan is to ask the person who took charge of the cleaning what happened to it. If they can find it and let me know where it is, no problem, and we have a few weeks before the first class anyway. If they threw them away, then I expect to be compensated for the devices- wood, screws, labor, etc. On a more positive note. got e-mail confirmation today that my big print order from early this week finally shipped. Have a tracking number and an estimated delivery date next week. Last time I ordered from this place the post office lost the package for a few days, after inexplicably sending it to the wrong town and then across the state while they figured it out, which I found especially odd, since the correct shipping address appeared on both printed shipping labels (company and post office) affixed to the package. I'll be relieved when it arrives in my hands. Despite promises from weathermen, the high temperatures and extreme humidity are still hanging around. But at least I didn't have to mow the lawn today, having done that for the past few days. Lots of errands to take care of, and so I managed to squeeze in a quick Studio visit. 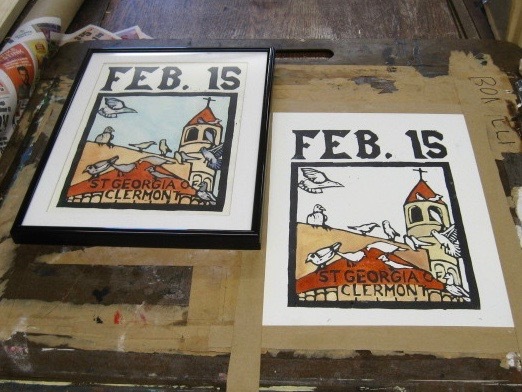 Back in April I had pulled the above proof of the most recent saint print and left it to dry in my rack. Obviously it would be dry by now, so the next step is to tape it down and prepare for coloring. So late in the morning I drove up to Ocean Grove with a drawing board and some paper tape. Looked into a few things in the building, then quickly took care of the task of taping the proof to a board, which will help keep it flat after I color it As I said last time, as a black and white proof it is far from perfect, but I think that the watercolor will help hide the few minor flaws. The Fourth of July is a very important day for a variety of reasons that affect almost everyone. The declaration of that day was a starting point of our nation, and for good and bad, the United States of America has had a huge effect on almost everyone in the world. And for those of us who live in this country, it is practically a holy day. Like religious holy days, it comes with a whole bunch of associated things that have nothing to do with the origin of our country, but are still enjoyed by many people. Like fireworks, a big custom associated with this holiday. Every town around here has its own show, so if you miss your local one, you can catch another. I watched a show from my kitchen window the other day, seen over the rooftop of the next building, between a couple of tall leafy trees. We are several days into a long heat wave, no rain in sight, so nothing to interfere with all the local fireworks shows. When I was creating a fictitious nighttime boardwalk scene, of course I put a fireworks display as part of it. 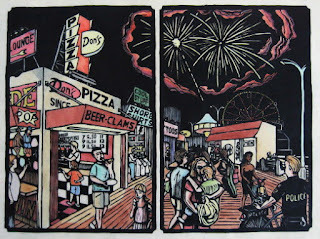 For myself, the Fourth of July also refers to my largest single body of work, the woodcut series of the same name, created from 1993 to 1994. Very little of the series is about anything specific to that day on the calendar, but since it was done in the years when I was in the midwest completing my college education, I consider it to be my first "american" work, by which I mean a piece about the American experience in general. For example, the boardwalk series is about the boardwalk experience, a coastal phenomenon. The Ecclesiastes series is about all mankind and the world and the history of civilization. But the Fourth of July series is about life in America. Being my life, it's a bit heavy on art, but it's also about cars, and trains, and highways, and farms, and corn on the cob (which I ate today at my brother's holiday cookout), and diners. and county fairs, and laboring, and farming, and interaction with immigrants, and shopping in big box stores and local rural stores, and everything else that can happen in a year. The link embedded at the top of this paragraph can take you to the series if you need to see it. We are now in July. Even if I never had a calendar, no doubt about summer- the consecutive days of 100 degree temperatures and high humidity say it all. I have a bunch of summer workshops and classes on my schedule, so if I'm stuck inside most of the day in front of my air conditioner, I may as well use the time to get ready. I'm talking about materials, since I am somewhat responsible for making sure people have what they need. Unfortunately, few place in the area sell anything that is needed, which is why I have to start preparing now. 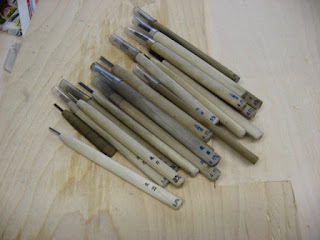 Actually I began last night, doing an inventory of my woodcut class tools. Over the past few years it has been my practice to use some of the materials money to purchase items that everyone will be using, now or later in the class. 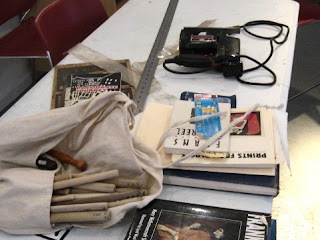 As a result, I have a decent pile of inexpensive quality tools, which I make available to the whole class at each meeting. (if they want their own to use in between, I give them the catalog information) I had plenty to serve my two students earlier this summer, but the next time (about 2 weeks from now) we have 6 signed up. So this morning, before the heat reached its high point, I went up to the Studio to test what I have. Nice big table with room to spread out, and all my spare wood is stored there. It turned out most of what I had was in pretty good shape, but for 6 students, I think I'll need several more. Materials fees from 6 students means I can afford to buy more. Out again in the afternoon and one of my stops was a local dollar store, which I was told would be a good source for what I needed. Indeed, they had plenty of rolls of non-slip shelf liner. A rubbery mesh like substance, which I guess is designed to line shelves, but (as to borrow a line from William Gibson) the street finds its own uses for things. I learned about this stuff from a former student, who was told about it in another woodcut class she took- does a good job of holding the wood block in place while being cut, reducing the effort needed to hold it down. The rolls are 1 foot by 5 feet, enough to make several non skid mats. After cooling off back home for a few minutes, I put the finishing touches on my big supply order from Portland. 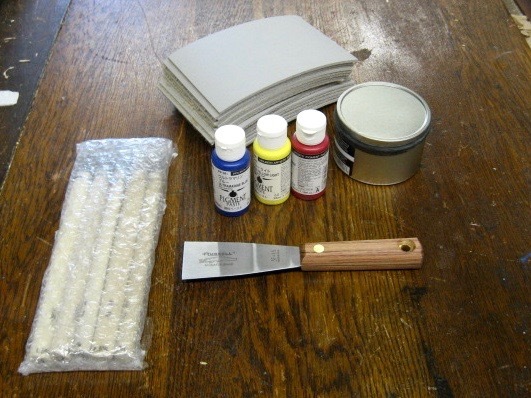 Several more woodcut tools, more ink, linoleum for my lino cut classes later in the summer. So that is taken care of. I may do more later tonight, but this day has not been a waste.